The intention is to modify our S3 to have some serious power. This will include replacing the turbo to a much larger unit. Before we do this we want to have a better flowing exhaust system. 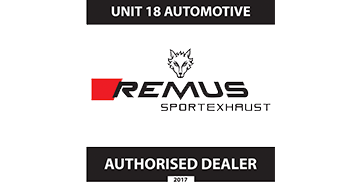 We are a REMUS dealer and we chose REMUS over many other popular brands, due to their superior build quality. We have been servicing cars modified by owners, ourselves and other tuners for several years. This gives us the opportunity to see how other brands fair over a combination of age and usage. We contacted REMUS and before we knew it we had a full turbo back system, including 200cell sports cat, delivered with some slash cut chrome tips. Other tips are available and are personal preference. The REMUS system is so well made the fitment was excellent. We observed during fitting that the exhaust valve controllers are installed in a slightly different position than standard. Some tuners may adjust the motor by force to allow the coil to sit in the cup of the exhaust valve. At Unit18 we reset the vales using our genuine ODIS software. 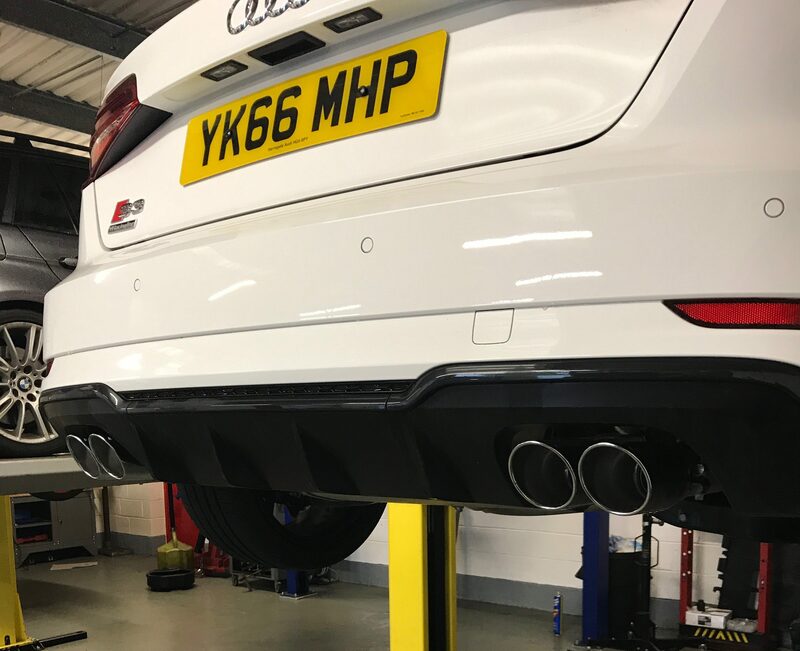 The old exhaust system was removed with minimal hassle and as with all standard system removals, the system was removed in such a way that it could be refitted. However it will not be refitted to this S3. As the car was new and had only covered 2000 miles, the system was still clean and corrosion free. The REMUS system was fitted with no hassle and the tail pipes were aligned and secured. As with all stainless steel exhaust systems, these will need re adjusting after the system has had a few heat cycles. The tailpipes are larger than the standard pipes and make the car look a little more aggressive. The S3 has a diffuser as standard and the chrome tailpipes fill the gaps much better than the standard ones. Most people change an exhaust to give more sound. So lets start here. The REMUS system has a unique sound and we love the rumble from the exhaust on tick over. We have a detailed video of the exhaust below. This was taken on the way to Uni18 from my house the morning of the fitting, driving around from Unit18 to my house and some drive by driving under full throttle. The video was taken using a GP session camera mounted to the back of the car. The drive by shots were the same camera on a tripod with no wind protection, to give a more accurate open air sound. both recordings were also taken with the exhaust valves open. As standard most modern day Audi Sport and Rally Sport models, come with active exhaust valves. 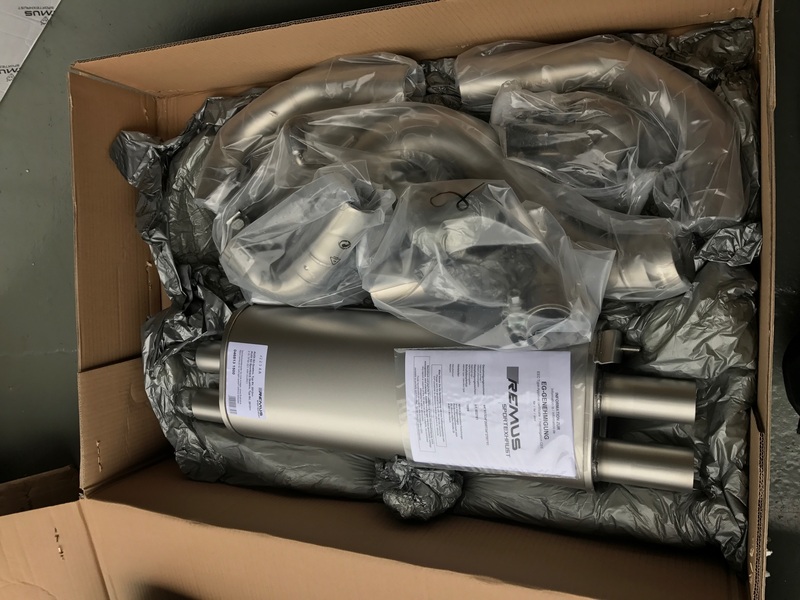 We often get asked information about how the valves operate and how their operation transfers to aftermarket exhaust systems such as the REMUS. The S3 has four tailpipes and the valves operate in the outside tailpipe of each side. Opening and closing depending on throttle position and driving mode. When the ignition is turned off the valves will fully open and remain open until the throttle pedal is engaged after starting the car. This makes startup, in any driving mode, the same. Efficiency: The valves are permanently shut. We have seen on occasion that when pressing the throttle fully, including the kick down button under the pedal, that the vales do open for a short time. As efficiency mode is for driving distance on the motorway, having a quiet system is the best option. Comfort: The valves are active in this mode. Driving normally around town or on a dual carriage way. The valve will close if you blip the throttle on start up. They remain closed until 2800RPM. The driving style in this mode has no affect. Auto: This driving mode is unpredictable, it can use any of the other driving modes based on the driving style it observes from the driver. Dynamic: This mode is the “loud button” dynamic mode has several differences in its setup. We will cover this in another blog post. But with regards to the valves in the exhaust, it opens them permanently. This is mainly due to the over run feature in dynamic mode. This allows the exhaust the pop and bang off the throttle. Individual: This mode is where the driver can setup the car. Again we will cover this in more detail in a future blog post. However with regards to the exhaust valves, it will allow you to have all the dynamic settings but reduce the exhaust note. Something that may come in handy on track days if a track has a low noise limit. The REMUS system works with the existing valves and after we had fitted them to the REMUS system it was a simple case of using our genuine ODIS software to access the reset feature of each valve. We instruct the valve motor to search for resistance. Once it spins and clips into place the valve is full operational. At the start of this post we detailed we are looking to increase the power of the S3 using a bigger turbo. So although the REMUS was not fitted to give us immediate performance increases we never the less realise some people would be doing this modification to add power gains. As the REMUS system is a turbo back system it needed to be paired with a stage 2 base map. The mapping software is from another partner of of ours and we are currently working with them to produce a stage 2 remap and a DSG (S-Tronic) gearbox software upgrade. Once we have completed this we will add another post. At the time of posting this blog post, the S3 is my daily car, and I drive around 15k every year. I have had the REMUS on now for well over 3 months. The combination of the noise, looks and increased performance is excellent. we drove to the Austria GP in July, a distance of 2000 miles in total, along a combination of motorway, mountain roads and city driving. The car was flawless. In summary REMUS is a choice that we at Unit18 feel will suit most of our customer base. The build quality is amazing and the exhaust will most likely outlast the car. The noise is spot on. Good for a blast and getting noticed, but will also be dead quiet when driving on the motorway. The tailpipe options and the fact it works with the Audi active exhaust is also a plus.